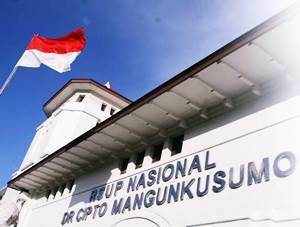 RSUP Nasional Dr Cipto Mangunkusumo – RSUPN Dr Cipto Mangunkusumo or referred to as “RSCM” is a reputable government general hospital in Indonesia, located in Central Jakarta. RSCM is owned and managed by the Ministry of Health of the Republic of Indonesia with management status of Public Service Agency (BLU). RSCM is recognized as class A Hospital in Indonesia. The Hospital also serves as a teaching hospital, one of which is the Faculty of Medicine, University of Indonesia. RSCM is registered at Jl Diponegoro No 71 Jakarta Pusat. According to RSCM’s profile as cited by JobsCDC.com, RSCM has a total land area 117,910 m2 and building area of 512,002.64 m2 spread in 5 locations, comprising Jl Diponegoro Jakarta, Jl Cik Ditiro No 6 Jakarta, Jl Cik Ditiro No5, 7 Jakarta, Jl Raden Saleh Jakarta, and Jl Adityawarman Jakarta (PKG). As of August 2015, RSCM has a total installed bed capacity of 1,001 beds. Possess certification in emergency (ATLS, ACLS, PTC and PPGD) which is still valid in the last 2 years. Able to work under emergency conditions. Maximum age of 35 years old on 1 December 2016. Graduated from an accredited university (minimum B) with GPA min. 2.75 within 4.00 scales. Not in a bond with other agencies or other companies.